At the time of the 1840 Tithe Survey, the site of the house was part of Plot 126, a house and garden owned by Thomas Wise and occupied by John Marshman. Bernard and Laura Symes – we believe Jubilee House was built by WW Pitcher and son, the local builders, around the time of Queen Victoria’s Jubilee in 1887. It was listed as ‘Jubilee House’ in the 1891 census although it was not shown on the 1881 map of the town. 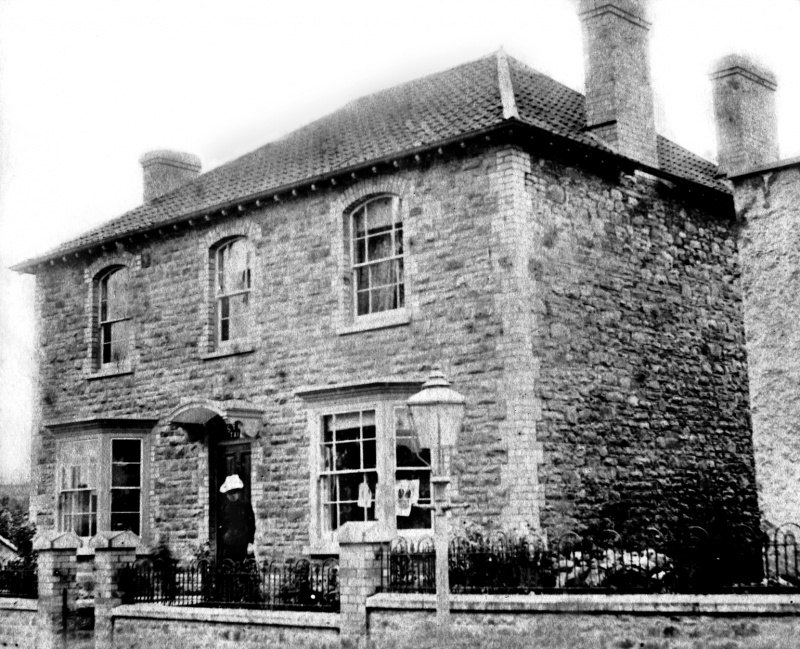 In 1881, Gillingstool Cottage, the house opposite the Baptist Church, had a large garden and the house was occupied at that time by Hannah Dyer, the house’s owner, and Bernard Symes and his family. It appears that Bernard arranged to have Jubilee House built in the garden of Gillingstool Cottage between the house and the school. On Bernard’s death in 1892, his wife, Laura Symes, became the owner and this continued until she died in 1911. We have found a newspaper article dated 17th November 1898 in which Mrs Symes made a complaint to the Thornbury School Board. She said that her house, then occupied by Alfred Gill and his family, was much overlooked by the newly erected school buildings and it had depreciated in consequence. The School Board ‘decided to take no notice of the matter’. The photograph above was taken during the time that Bernard Symes lived in the house as the window above the door says “Symes Tailors”. The style of house is very similar to the Pitcher’s own house in Gloucester Road, now number 24, which was built around the same time. We have the report of the wedding of Cecil Hull and Eleanor Joyce Pearce who married in July 1935. The report of the wedding says that the couple’s address was to be Jubilee House. Cecil Frank Hull, the son of Mr and Mrs W Hull of Dinder, Wells in Somerset was employed at Thornbury LMS Station and his wedding presents included one from Mr P Cooper and staff. It seems likely that the couple went to lodge at Jubilee House with Phillip and Mabel Cooper. By the electoral roll of 1938 Cecil and Eleanor were living in Eastland Avenue. Following the deaths of Charles, and his son, Phillip, Mabel Grace Cooper continued to live in Jubilee House. She died on 27th January 1970 and the property transferred to her niece, Rhoda Lois Ball and her husband Ernest Frederick Ball. On 24th February 1972 they sold the property to Gloucestershire County Council for £5750. The Council wanted the front of the property to widen the road. They sold the remainder to Northavon District Council on 23rd August 1976. The house was demolished and the land became part of the Rock Street car park.